Brocade has brought much-needed enhancements to the IPv6 capabilities available in ServerIron ADX series with software release version 12.3. The details are a bit unclear as this blog entry is being written since the Brocade website still seems to have collateral related to release 12.2. The You-Tube announcement does reference a standards-based NAT64, which should be an implementation of the soon to be published RFC currently called draft-ietf-behave-v6v4-xlate-stateful, but there was no specific statement related to that. On June 8 the websites listed here will offer their content over IPv6. The goal of World IPv6 Day is to motivate organizations across the industry – Internet service providers, hardware makers, operating system vendors and web companies – to prepare their services for IPv6 to ensure a successful transition as IPv4 addresses run out. Dutch organisation SURFnet has created a document that looks in depth at how they deployed IPv6 across their network. Intended for network architects and network managers implementing IPv6 in their organisations, the document has been translated by the RIPE NCC and is available online. According to this post on the WoW battle.net forum, the latest PTR (Public Test Realm) patch contains configuration settings to enable IPv6. This would be the first big game to support IPv6 as a connection protocol. With around 3.5 million players from Asia, the part of the world most likely to run out of IPv4 the fastest, this is well thought out move. Lets hope other game developers start supporting IPv6. Are you reading this Valve? NEW YORK, NY March 16, 2011—NYI (www.nyi.net), a New York City-based, mission-critical data services provider, today announced IPv6 corporate compliance, the company’s latest milestone in its aggressive campaign to support World IPv6 Day, June 8, 2011. The news comes on the heels of NYI’s February announcement of full client support of the new network protocol that replaces the depleted supply of Internet Protocol version 4 (IPv4) addresses with a brand-new pool that offers such functionality as improved performance rate and security as well as reduced latency. By achieving corporate compliance, NYI’s principal web presence is now v6 reachable, placing it at the forefront of supporters who understand the importance of raising awareness. To find out more about World IPv6 Day and lend your support, visit: http://isoc.org/wp/worldipv6day/. For any business-critical questions about deploying IPv6, NYI has set up a special support team whom you can contact at [email protected] or 1-800-288-7387. Last year, we presented statistics on the number of RIPE NCC members and the resources distributed to them. Now, one year later, we revisit the topic and look at how things evolved in 2010. We were particularly interested to see how the number of IPv6 allocations increased over time. With unallocated IPv4 addresses nearing exhaustion, it is good to see the number of IPv6 allocations continued to grow exponentially in 2010 and early 2011. A total of 834 new allocations were made in 2010, compared to 554 in 2009. The graph below shows demand for IPv6 addresses was especially high during the last two months: 316 IPv6 allocations were made in January and February 2011 alone. Another good sign is the growth in the number of LIRs holding an IPv6 allocation. 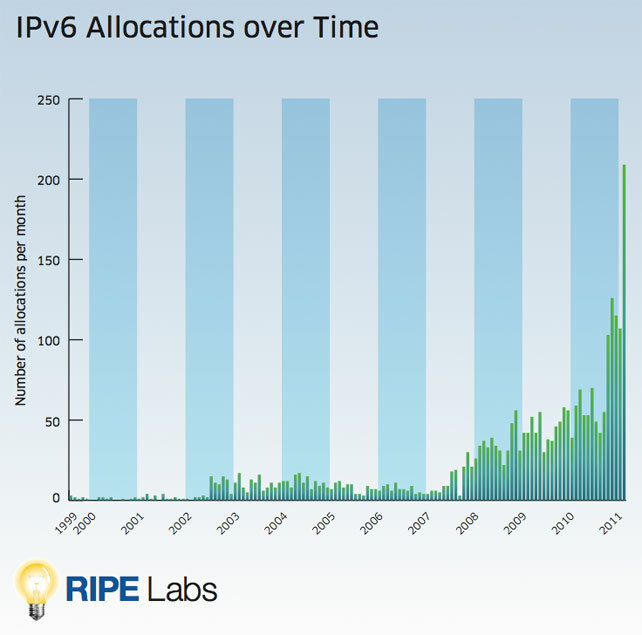 The percentage of the RIPE NCC membership with one or more IPv6 allocations increased from 25% in 2009 to 35% in 2010.